"...Wechsler's production at Theater Wit is a bit fussy, physically, but it�s fast-paced, provocative and, crucially, acted throughout with the right combination of intellectual smugness, personal vulnerability and familial love." "...Sherri's bubble of dubious liberal ideals stretches thin when Ginnie's son gets into Yale and hers is only waitlisted. Sherri's son, Charlie, uses the language of inclusion to deconstruct its incompatibility with the basic tenets of capitalism and thus the hypocrisy of his white savior parents. Ginnie hates Asians because that's OK. Race is used as a trading card in this play, but the race that's on trial here is the one that invented them all. Admissions is a blistering, disturbingly apt critique of how white supremacist ideas blight the white liberal elite." "...While the dramatic stakes in Joshua Harmon's incisive criticism may not invoke the all-inclusive sympathy of his groundbreaking ( and structurally similar ) Bad Jews, there is no denying the evidence of a generation claiming the moral high ground since the 1960s, having secured their lofty bulwark, abandoning their principles in pursuit of preserving the advantages gained thereby-hubris deserving of examination by youthful inquisitors." "...Harmon�s skewering of white liberal hypocrisy contains sharp insights into the ways that sincerely held beliefs can curdle into dogma. From the get-go, Sherr�s commitment to diversity manifests itself in ugly ways; her conversations with Perry�s white mother, Ginnie (India Whiteside), reveal unpleasant assumptions. But Harmon�s zero-sum approach has its limits. Charlie�s big revelation turns the show into more of a trolling thought experiment than an honest piece of satire: Once he drops the bomb on his unsuspecting mother, the play fizzles out. A steady diet of laughs might keep this ostensible comedy aloft, but that�s where Jeremy Wechsler�s direction fails to deliver. Not coincidentally, several of the show�s best scenes, featuring Judi Schindler as an elderly and overly literal school employee, are also its funniest; elsewhere, however, uncertain performances and erratic pacing turn the show into a slog. Admissions is an imperfect play, but this production lands it firmly in the rejection pile." "...Harmon fares well at covering the question from all sides, avoiding wishful thinking, rote responses, or predictable conflicts. Avoiding David Mamet�s smug hypocrisy, the play never takes cheap shots at limousine liberals. Thanks to Curry�s frenetically forceful performance, Charlie in particular seems to embody all the arguments at once. The actor�s anguish perfectly fits the character�s confusion." "...The play can be difficult because it�s a combination of humor with social justice and drama, and you find yourself sitting on the fence deciding which side you are on. For a play that deals with diversity, there is no diversity in the actors, and the director Jeremy Wechsler, explains that after the show, when he has a sit down with the audience about the meaning behind the show." "...The real misfortune of this pessimistic tautology is how it�s placed within a technically excellent (and far, far too white) show with some insight into labels and the gaps in our privilege. It�s well-put-together and the cast is dynamite, albeit with a slow start and some strange pacing here and there. But politically, the mechanism is broken, hoisted by its own petard, and the ultimate takeaway is too obvious to enlighten: the question �Can we be better?� is answered with a negative." "...This isn�t a perfect play, but Jeremy Wechsler�s production is every bit as powerful as any of Theater Wit�s other terrific professional productions. Laced with laughter, this play is very moving, yet quite uncomfortable to watch, at times. However, it�s bound to provoke lots of post-show discussion and will inspire audiences to think about what it means to create diversity in schools, the workplace and society. The lack of honesty that haunts our work toward diversity, in a 21st century that�s finally seeing a world of color, is what Joshua Harmon speaks about the loudest. It�s a shout that needs to be heard today." 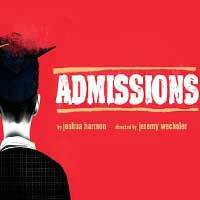 "...Joshua Harmon's play "Admissions" anticipated this scandal by a year with his satire "Admissions," now receiving a terrific production at Theater Wit. Actually, Harmon's play doesn't traffic in the criminality of huge bribes offered by famous people to get their offspring into a desired school. "Admissions" takes its audience into a much more recognizable world, one that probes issues of race and abuse of privilege to achieve goals through methods that most parents would accept as necessary, even at the cost of a little ethics fudging." "...ADMISSIONS is a timely sneak peek into collegiate competition among parents. The writing, directing and acting is a solid A+. Special nod out to Scenic Designer Jose Manual Diaz-Soto for his transitional set that keeps the pacing tight." "...But this is not a play that pulls punches: Harmon�s script puts everything on the table, and he is absolutely unafraid to rake his own over the coals. Like the current scandal in the real world, Admissions trades on the notion of white privilege and asks what the limits are for how parents help their children in matters like this. Ultimately, we are asked to examine our own truths on this issue, and the play, which posits a �perfect� solution and quickly shoots it down as impractical, suggests strongly that we will come up wanting. And if it hits a bit too close to home, so be it: that is clearly what Harmon and Wechsler are going for." "...The startling truths and sardonic humor in Joshua Harmon's "Admissions," directed by Jeremy Wechsler and now playing at Theater Wit, hover on a bubble that has been taking on air in every college admissions program across the nation in recent weeks. Much of what occurs in the lives of the liberal-minded Mason family-particularly to student Charlie Mason, played on the edge with reckless abandon by Kyle Curry in a breakout role-strikes directly at the relationship between parents and top-tier institutions that pursue diversity, gender balance, and a robust legacy program to bolster their national and international academic reputation and validate meteoric capital campaigns goals. As an example of what is at stake, Yale, the university of choice in the "Admissions" storyline, is, in real life, in the quiet phase of a new campaign now. The last one raised an astounding $3.88 billion, in 2011."